What could be more refreshing and healthy than a bowl of fresh fruit and yoghurt? Many people have stressful jobs that leave them little time to relax in the morning, nevertheless breakfast is always important. Making your way to the kitchen, there is always a debate of what to prepare that is both healthy and quick. Various dairy products are popular; from cheese on toast to cereal with milk, but one of the healthier options is a tub of yoghurt. Frozen yoghurt has become a popular dessert, however it is important to be careful of the sugar content, which rises with every syrup added to what could otherwise be a healthy dessert. Over years of production, this snack has become sugar-packed, so the health benefits of yoghurt are better received from a simple tub of plain yoghurt. 1. The amount of calcium in an 8 oz. serving of yoghurt has approximately 35% of an adult’s daily recommended calcium intake. Research has shown calcium helps prevent colon cancer since it thwarts the build up of bile which can irritate the colon wall. For those who are lactose intolerant, yoghurt is a great way to give the body the calcium it needs. The cultures in yoghurt provide the enzyme lactase, which breaks down the lactose. 2. One mineral which is needed for a multitude of different purposes is phosphorus. It’s main use is in building strong bones and teeth, making it a necessary mineral for the older generation who are more prone to osteoporosis. Natural yoghurt has about 40% of the amount of phosphorus for an adult’s daily diet, and being an aid in energy production, it is worth making plain yoghurt part of your day. 3. 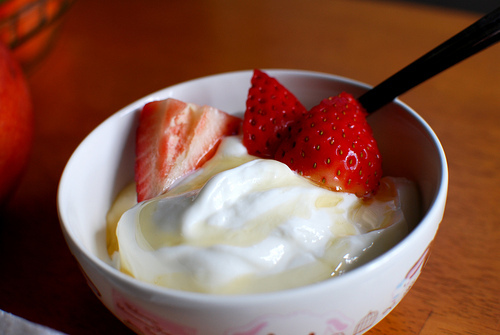 Yoghurt provides the body with several vitamins including various forms of Vitamin B. These vitamins have numerous tasks in the body including; keeping your blood healthy, releasing energy from food and maintaining cardiac and neurological function. Overall, yoghurt has between 20-40% of the body’s needed Vitamin B intake. 4. The active cultures in yoghurt help prevent various gastrointestinal conditions, from mild constipation or diarrhea, to inflammatory bowel disease. A percentage of the live bacteria in the yoghurt survive the acidity of the stomach, reaching the intestinal tract, where it encourages the right kind of bacteria to multiply, aiding digestion. When looking through the many varieties of yoghurt on the shelf, make sure you purchase those with live and active cultures. It is equally important to be aware of the sugar content. There are a number of tasty dips that can be made with yoghurt, or you can sweeten it with fresh fruit for a great breakfast. Making it part of the daily diet can only add to your health.